agnarohm is a stereo EQ / Overdrive suite. It also features noise gate, compression, tuner, flanger, tonestack, preamp, uniphaser, cab simulation, delay and reverb units, making it suitable for guitar and bass (or any other instrument) signal processing. Instead of simulating existing hardware preamp heads, agnarohm offers totally customizable tonestack, preamp and pre / post equalizer units in order to achieve a great variety of amplification character and sound. Randomization functions are also available so that the user can focus on performing while quickly trying new complex settings and combinations literally at the push of a button. Noise gate, compression, tuner, flanger, equalizers, preamp / drive, tremolo, uniphaser, cabinet simulator, reverb, delay. 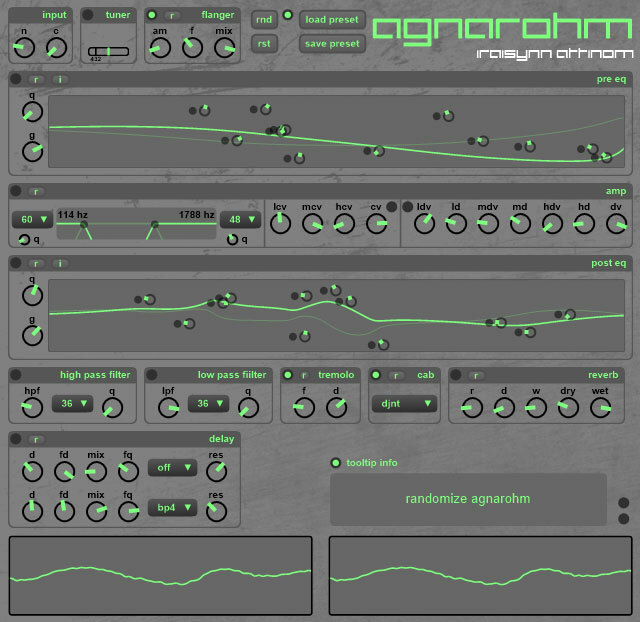 agnarohm is 32bit windows VST plug-in/ standalone. if you want to use it on a x64 DAW that does not already support bridging, take a look at this. right click or ctrl + left click now sets knobs to default value. added eq init / reset button. Added internal cabinet simulator with 4 cabinet options (more to come). Added invert right channel switch for richer sound from mono sources. Changing compression ammount now recalculates auto-gain. added right channel slight delay switch for richer sound from mono sources. added on / off switches randomization isolation switch. added more controls to the amp unit to allow mixing clean and distorted signals. optimized knob, switch and list randomization method.